LISA Y. GARIBAY | August 1, 2014 | UNIVERSITY COMMUNICATIONS. Work With a Scientist Program Director Pei-Ling Hsu, Ph.D.
School students selected to participate in the program's first year. Photo courtesy of Pei-Ling Hsu. A four-year, $1.5 million grant from the National Science Foundation (NSF) has just finished giving high school students a taste of hands-on research alongside UTEP scientists. The Work With a Scientist Program partnered UTEP's colleges of Education, Engineering and Science with the El Paso Independent School District (EPISD) to provide immersive learning opportunities for high schoolers to learn the ins-and-outs of research under the guidance of professional scientists, who are also faculty within those colleges. "The spirit of the project is to introduce the pedagogical tool of cogenerative dialogues – in which scientists and high school students discuss and develop the teaching and learning process – with the goal of shortening gaps in knowledge, status or power between them," said program director Pei-Ling Hsu, Ph.D., assistant professor of science education and the grant's principal investigator. Hsu's goal is to gauge how the use of cogenerative dialogues impact the number of students who pursue science, technology, engineering and mathematics, or STEM, fields in college. Irvin High School was chosen for the program's first year based on its designation by the Texas Education Agency as a T-STEM Academy, which means the campus curriculum is tied to STEM subjects in order to improve students' chances of pursuing higher education and careers in STEM fields. After the program was funded in October 2013, two months of student recruitment followed, involving the distribution of flyers and posters, class presentations, screening of recruitment videos, and family night presentations for students and parents. Students had to have a 3.0 or higher GPA and be in 11th grade in order to apply. Interviews between the students and program directors completed the application process. Thirty-six students and their family members attended an orientation in December 2013 where relevant research materials and safety trainings were distributed, and the program scientists introduced. The orientation also had tours of the labs and a Q-and-A session. Arlene Perez, who received her bachelor's degree in biology at UTEP and now teaches biology at Irvin, accompanied the young students on their internship activities throughout the program. "I thought it was an honor and that it would be a great thing for our students," Perez said. "They don't usually get those encouragements and I thought it would be a great opportunity for them." After five years as a high school teacher, Perez was encouraged by how Work With a Scientist helped to fill major gaps unaddressed by a standard high school curriculum. Students were able to do a lot of the hands-on work they could not do within their own classrooms due to restrictions in funding and time. The mentor scientists guided the students through the process of choosing a research topic, which was a major milestone for the students in terms of self-guidance and follow-through. The process boosted the students' confidence as well. The impressive list of projects spanned environmental and health sciences, the human body, technology and 3-D printing. "It's a lot different than what we usually do at high school," said Irvin student Laura Garcia, who worked alongside Associate Professor of Chemistry Wen-Yee Lee, Ph.D., on the project "To Drink or Not to Drink," shedding light on the BPA component in plastic bottles. "You have a lot more opportunities to squeeze your ideas in there and get creative with whatever you're doing." Garcia appreciated Lee's patience and how the scientist addressed her and her high school peers as equals, and how he expected them to maintain a fast pace to complete the projects. Christopher Yanez was initially interested in doing something new, but unsure of pursuing a science career before participating in Work With a Scientist. He began working under Associate Professor of Industrial, Manufacturing and Systems Engineering Tzu-Liang "Bill" Tseng, Ph.D. on the project "Design Improvement of Battery Lego Car Using a 3-D Printer," which explored the potential of 3-D printing as a tool for making useful products that are stronger, lighter and more energy efficient. "I never knew 3-D printing was going on in El Paso," Yanez said. "I never thought it was something I could do at my age or coming from a Hispanic family." Prior to Work With a Scientist, Yanez had planned to attend college. With the introduction to this particular research, he is excited to follow a mechanical engineering path. Hsu considers the program important for both UTEP and the wider scientific community, especially given the challenge of communicating to scientists how important it is to listen to students' ideas. The program's broad impact fosters the integration of education and research at different levels, including high school and postsecondary education, teachers' professional development, and scientific and social science research. As a result, Work With a Scientist allows science educators to create better programs for future student-scientist partnerships. Participating in the program also helped Perez change some of her own pedagogy. She planned to implement many aspects of the program in her classroom, like having students write a weekly journal. "I don't think students understand how much writing you have to do in the sciences," she said, noting that communication is everywhere and that younger generations must get more adept at it in order to enter the workforce. In its second year, the program will involve students at Irvin and Chapin high schools. The project concludes in September 2017. 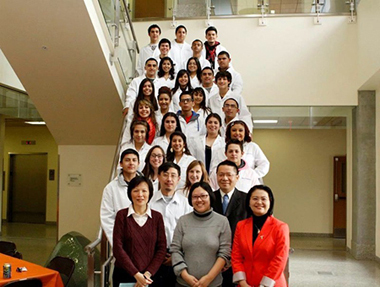 Witnessing each student's transformation was the greatest reward for Hsu, especially given that Work With a Scientist's unique structure aims not only to create a learner-centered program that empowers students to speak equally with scientists and conduct research based on their own interests, but to also prove this type of curriculum works. "Many students were anxious at the beginning about the challenges to speak to scientists equally and to conduct their own scientific projects," Hsu said. "However, at the end, students were confident with their projects and conducted professional presentations successfully." Perez believes that many of the participating students have changed their minds about what they think about college and have reaffirmed their commitment to attend with a very optimistic outlook. This is a big step for students like Garcia, Yanez and their peers, many of whom have immigrant parents who may not have made it to high school, much less a university. "The program showed me that it's possible to go farther than I thought," said Yanez, who is grateful to the program directors for making such an opportunity possible. "It's easy to struggle in one class or another in high school and start to put yourself down. But this program gave me the ability to think that I could keep striving, keep my focus on math since I'm good at it and do something I never imagined."